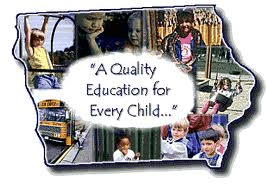 The crux of the report is Iowalive’s claim that the standards our Department of Education is using to report student proficiency levels is misleading.Â This, according to the group, stems from Iowa having adopted a lower standard to measure student learning called the “40th National Percentile Rank”.Â This current set of standards was adopted a decade ago by the then Governor Vilsack administration and is different from a more “honest” standard used by other states known as the “65th National Percentile Rank”.Â The 40th National Percentile Rank standards that we use now apparently do not actually require a student to be proficient in various skills at their grade level to be deemed as such.Â The obvious problem here being that if this is the case, parents are being told their child is succeeding at their grade level when in fact they are not.Â If true this is absolutely unacceptable. Between long declining national education rankings, the misrepresenting of graduation rates at some Des Moines High Schools, and the entire Nancy Sebring debacle–the education system here in Iowa hasn’t exactly built a huge reservoir of trust recently.Â Despite this, and despite the fact spending on K-12 has increased $650 million since 2002 (+35.4%), the legislature is potentially poised to yet again increase the dollars flowing into this institution by almost $200 million any day now.Â If the claims of Iowalive have any merit it’s long past the time to say enough is enough–the river of funds needs to be damned until the system functions honestly and properly. This issue will be looked into further by this website in the coming weeks, including a specific explanation of the two sets of standards.Â At first glance the source–Iowalive–appears to be legitimate group with expertise in education and statistics (I was unfamiliar with them prior to late last week).Â In the meantime I encourage you to visit their website (link here ), and become informed on their general claims.Â If everything they say checks out, this level of brazen misrepresentation and deception to Iowa parents will be a massive outrage.Â If a teacher tells a parent their child is performing “at a 3rd grade level” in a subject, that better mean exactly that–anything else would be totally unacceptable. Without a doubt Iowa legislators from both parties and both chambers should demand an explanation from Jason Glass and the Department of Education.Â If it turns out they have been “cooking the books” with a deliberately low standard to enhance our schools perceived performance, then the reform bill currently being discussed should be tabled immediately. Below is an excerpt from the Iowalive report, here is a link to the report complete with tables and source data , and more can be found at their website .Â Though the information is not presented in a lively way, these are serious charges that demand being responded to by our elected and unelected government officials.Â We as Iowans must have answers on this very, very soon. Finally, at 3:34 PM, Friday May 10, (to make it nearly impossible to make the Sunday Papers) the Department of Education provided Percent Proficient data Iowalive requested on Jan.14, 2013.Â The data would not have been provided at all except for prodding from State senators and the State Ombudsmanâ€”who are gratefully thanked for their help. As shown in the table below, the Department of Education reported to parents, students, legislators, taxpayers and others that 74.4% of Iowa 4th graders are ReadingÂ Proficiently (Expertly) at the 4th grade level, when in fact the Department of Education just admitted onlyÂ 40.3% are actually reading at the 4th grade level, when tested.Â This equates to an 85% inflation, or misrepresentation, of student achievementâ€”perpetrated by use of the bogus 40th NationalÂ Percentile Rank (NPR) Proficiency standard, adopted by the Department of Education, under Governor Vilsack and the ISEAÂ teacher union. Similarly, the table shows parents, students, legislators, taxpayers andÂ others were told 78.2% of Iowa 4th graders are doing Math Proficiently (Expertly) at the 4th grade level, when in fact the Department of Education just admitted onlyÂ 40.1% are actually doing Math at the 4th grade level, when tested.Â This equates to a 95% inflation or misrepresentation of student achievement. Similar misrepresentations for 8th and 11th grade reading and math are shown in the table.Â It must be stated that the DepartmentÂ of Education made NO corrections for cheating, as if none exists, despite gross cheating already under investigation in Davenport. The problem is: Iowaâ€™s low 40th NPR â€˜proficiencyâ€™ standard considers 4th graders scoring at the 3.1 Iowa grade level to be â€˜proficientâ€™ or expert 4th grade readers!Â Similarly, Iowaâ€™s low standard considers 8th graders scoring at the 6.9 Iowa grade level to be â€™proficientâ€™ or expert 8th grade readers, and 11th graders scoring at the 9.2 level to be “proficient” or expert 11 grade readers.Â The same applies to Math–and all grades tested.Â This is nearly double the number actually Proficient.Â And it is going on in grades 3, 5, 6, 7, 9, & 10 as well. Large Iowa media news editors have failed, and stubbornly refuse, to report these shameful, if not outright fraudulent,Â conditions to Iowans. Governor Branstad, youâ€™re a lawyerâ€”if this misrepresentation isnâ€™t fraudulent, what is? ?Â What are you going to do about it?Â This happened on your watchâ€”even though it started under Governor Vilsack!Â Â DE Director, Jason Glass, could have stopped using the bogus 40th NPR Proficiency Standard and replaced it with the honest 65th NPR, but he did not, Governor.Â How come?